Legendary sculptor Ernst Neizvestny was born in the Ural Mountains region of the USSR in 1926. Noticed as an artistically gifted child, he studied in Leningrad and Samarkand as a teenager and later in Riga and Moscow's Surikov Institute. 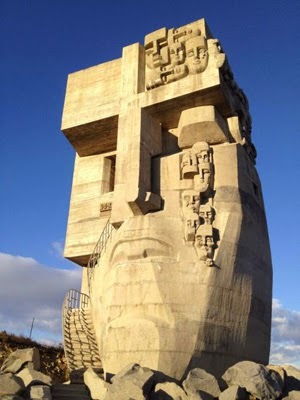 In 1962, Neizvestny's work was heavily criticized as "degenerate" by Soviet President Khrushchev, who publicly insulted numerous architects, sculptors, and composers. (Ironically, Neizvestny was approached by Khruschev's family to design and build Khruschev's tombstone in 1974 - a black and white monument symbolising the bright and dark sides of the Soviet leader and the post-Stalinist period). Neizvestny was one of the few living Russian artists whose work became known and admired in the West. This was largely the result of the admiration and advocacy of the English art critic John Berger, in whose opinion "Neizvestny is principally the first visual artist of genius to have emerged in the Soviet Union since the twenties." (Berger's 1968 book Art and Revolution: Ernst Neizvestny, Endurance, and the Role of the Artist was republished by Vintage Books in 1998 and is readily available). In 1965 the Grosvenor Gallery in London held a joint exhibition of works by Ernst Neizvestny and Marc Chagall. In the same year, an international jury awarded him first prize in the UNESCO-sponsored art competition in Belgrade, to honor the 700th anniversary of Dante. Among the participants were Robert Rauschenburg and Salvador Dali. 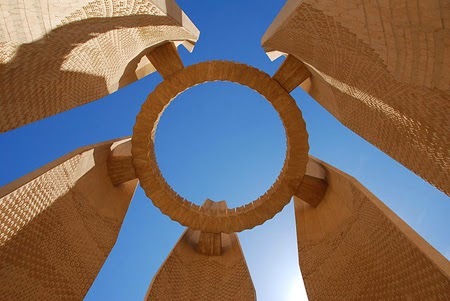 In 1968 Neizvestny won the international competition to design the sculpture for the Aswan Dam, Egypt. This monument - Lotus Blossom - is the world's largest sculpture. Throughout the 1970s, and before his exile to the West, he exhibited widely in Europe and New York. As Ashgabat transforms itself into a marble and gilded city, this rare and remarkable sculpture is one of the few monumental works that remain in the city from the Soviet period. 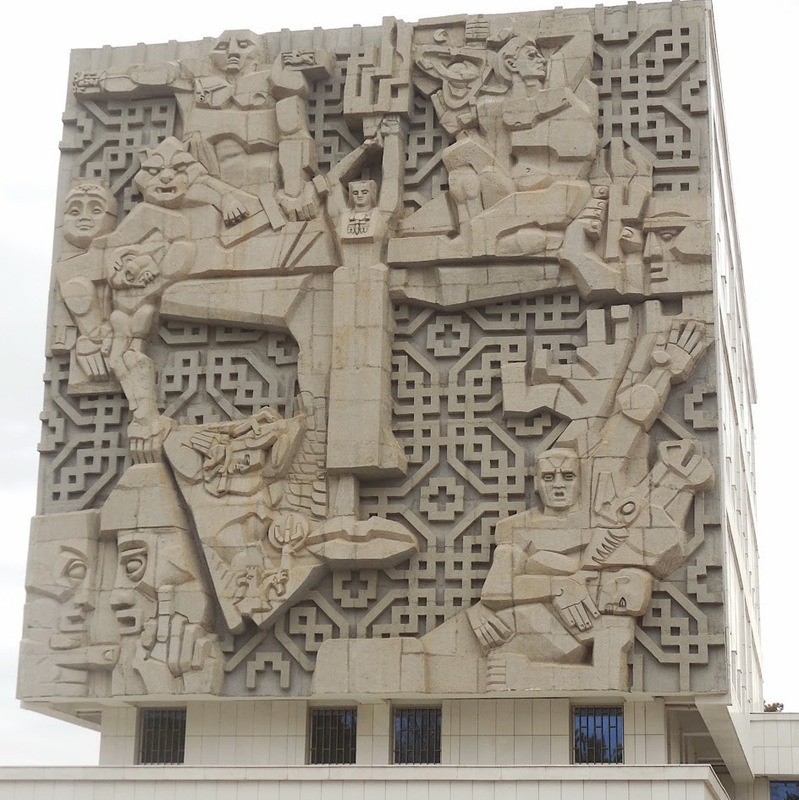 Neizvestny's concrete bas-relief decorates the former building of the Central Committee of the Communist Party of the Turkmen SSR. It is now the State Archive. In the panel, the face of Turkmenia is depicted, having thrown out the tsarist regime and built a socialist society through hard work and collective effort. In the centre of the composition heads of the imperial Russian double eagle lie torn from their bodies, trampled upon by a woman wearing a Turkmen ornament. The figure of the woman also forms the nose on the fifteen meter long face. As writer Maksat Alikperov noted: "The panel is very frightening; however, it is hard to take your eyes off it. One can only admire the talent of Neizvestny, who successfully combined the ideology of the victorious socialism, the national flavor, the inextinguishable flame of freedom, a furious cat, a suffering horse, and human limbs grown out of proportions from the works of Pablo Picasso". The sculpture also evidently caused a scandal when it was unveiled in 1975 because it was composed around the shape of a cross. After 65 applications for an exit visa were refused, Ernst Neizvestny finally emigrated to Zurich in 1976. He moved to New York in 1977, where he still lives. American playwright Arthur Miller described Neizvestny as an "artist of the East: who is regarded by Russians as an "expression of the country, of its soul, language, and spirit" and as a "prophet of the future". Evidently before his departure from the USSR, a friend asked him "Why did you decide to emigrate?" Neizvestny answered: "I am fed up. Look – if I create another work like the one in Ashgabat, I will simply die". Update August 2016: Ernst Neizvestny died in New York on 9 August 2016 at the age of 91. Photographer Ilia Torlin took brilliant images of Turkmenistan in 2008.